Discussion in 'Android News' started by pc747, Sep 29, 2018. 2009 was the year that started the phone that brought many of us here. And that phone was none other than the Motorola Droid. 9 years ago Google and Verizon needed a phone to compete with the iPhone. And Droid mania was formed. This forum came together because of the Droid. 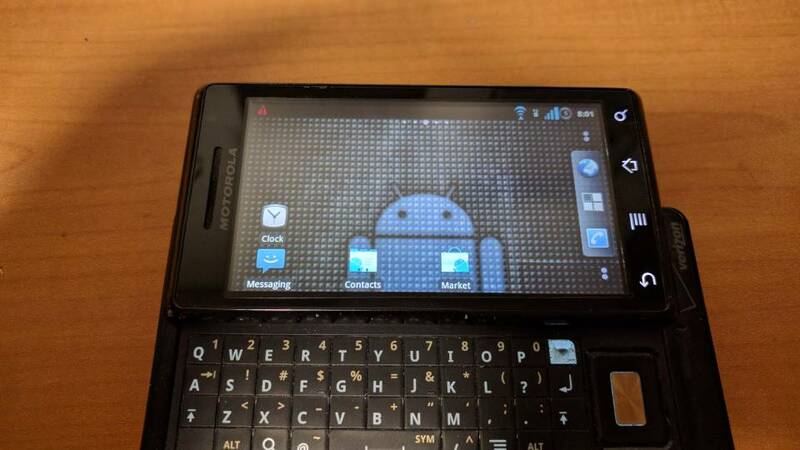 I go into more detail about the history of the Droid here (10 years of Android cont. : Let’s talk about 2009.). But I want to use this thread to celebrate the Droid, members of DroidForums, the staff that supported this forum, and the owners that started this forum (@danDroid &@JohnDroid). What was your favorite moment with the Droid? What was your favorite (or most memorable) moment here on DroidForums? My favorite moment was probably the day we booght them, and I realized that I really did like the phone, like Android, and realized all the cool things that smartphones were going to allow us to do. I was hesitant to get a smartphone in 2010, and didn't think they could really be beneficial. My wife convinced me to get us each a Droid when Verizon put them on sale for 2 for $99. Boy was I wrong, those things were awesome (and Android still is awesome today). I've told my story a numerous amount of times on here. An issue with AT&T and Apple led me to the droid, and I haven't looked back since. My favorite droid moment was when sholesmod updater came out. That changed my life. My favorite moment on this forum was leading up to the 2.1 release. This forum went 10 pages deep in a matter of hours, as we were all waiting for the OTA. I continue to have been blessed meeting each and every member on this forum (those that are here and those no longer here for whatever reason). Thank you all for the moments we shared with each and every phone and each and every update. I've told my story all over this forum too. I had the G1, then moved to an area that T-Mobile doesn't service, so I bought an LG Triton. One of the last dumb touchscreens before the Droid craze really took off. I was living with my cousins & we decided to get a plan together. I went with them to sign the papers & when they were looking at phones, I realized that the Droid ran Android, got excited, & paid full price for it on the spot. I found this forum during that 2.1 craze. I'm not even sure how I found out the update was coming back then, but I found this forum while Google searching, signed up, &the rest is history. Had some great times back in my rom'ing days & have met some great people thanks to this forum & my silly obsession with Android. I got my OG Droid on drop day and was waiting at the VZW store for them to open the doors. It was pretty hilarious because it seemed like all 20 employees had the new Droid phone. It took about an hour to get the phone, get it set up in the store, and get checked out. I don't think a single 30-second period went by without an employee's brand new phone going, "DROOOOIIIID!" with a text or email. I miss that "DROID" notification sound. Every now and then I'll install Zedge and put that notification sound on my phone. But about a week of that (and I'm being generous because really 3 days ) I'll be back to my stock notification sound. I loved it so much that my Note8 still says DROID when I get a notification. Had to do it! My original droid still functioned as my desk clock until a short time ago when it began to behave strangely. I picked it up and man it was HOT. Pulled out the battery (remember when you could actually do that ) and it was swollen so much it looked like it might burst. Sadly it now sits in a drawer sans battery looking old and tired sort of like me..
My friend had the iPhone and I was very excited to get the Droid when it first hit. I had the flip Razr at the time and loved that phone. But the Droid was so cool, loved the slideout keyboard - at the time! - and thought it had cooler features and was easier to use than the iPhone. Stayed with Android and Motorola all the way until I got the Pixel 2 XL which is the best Android phone IMO. I have an iPhone for work and can't express how little I think of it, really cumbersome and clunky to use. But I suppose that's what you get when you switch OS. Same here. Plus, I have never swayed from a Motorola phone. I've been tempted with the Samsung phones and the Pixel phones but for now, I'm sticking with MOTO.